Buy More Pre-Tied Striped Gift Bows Save More! 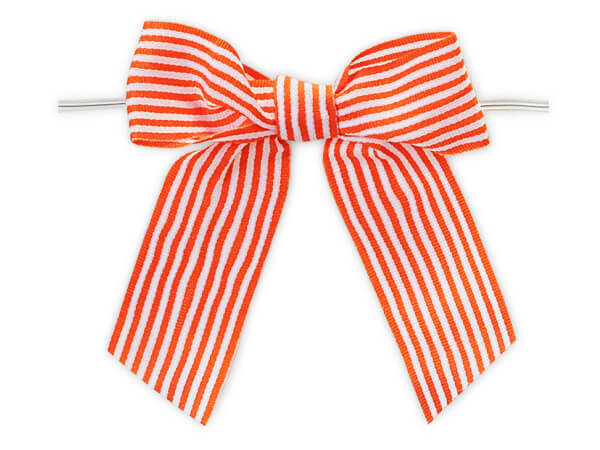 Orange Pre-Tied Striped Bows are 3" wide. Ribbon width is 7/8". The 6" plastic-coated wired twist ties allow easy attachment to any gift or cello bag. Super cute! Our mini striped grosgrain gift bows come with twist ties and available in many popular colors. Plastic-coated wire twist ties make these bows quick & easy to use! Packed as 12 bows in two polybags with a strong header for resale!